With a superior non-slip fabric-like finish and simple, elegant design, The Manduka PRO Mat will revolutionize your practice. There is a reason The Manduka PRO inspires such passion in its users - this incredibly dense yoga mat has unparalleled comfort and cushioning. With the superior non-slip fabric-like finish and simple, elegant design, The Manduka PRO will revolutionize your practice. Best of all, it comes with a Lifetime Guarantee. When you want the very best yoga mat, the mat chosen by yoga teachers around the world, there really is only one choice: The Manduka PRO - for your practice and for our world. 3.4 kg; 180 cm long; 66 cm wide; 6 mm thick. Standard: 7.5 lbs; 71" x 26"; 6 mm thick. Superior wear and longevity backed by a.
Closed-cell surface to keep moisture and sweat from seeping into the mat and breeding bacteria (ideal for hot yoga). High-density cushion for unparalleled experience, joint protection, and versatility on any surface (carpet, cement, hardwood floors). Fabric-like surface finish for slip-resistance, even with light perspiration, yet non-sticky for optimal movement between poses. Sustainable engineering ensures high quality material will not peel, flake or fade. Product improves with use over time. Proprietary dot pattern bottom to resist sliding. Made in Germany(birthplace of the modern yoga mat). High Density Cushion for unparalleled experience, joint protection, and versatility on any surface (carpet, cement, hardwood floors). An ultra-dense and spacious performance yoga mat that has unmatched comfort and cushioning. The PRO® will never wear out, guaranteed. We recommend pairing this with one of our performance. To Store: Roll your Black Mat PRO with the top side (fabric-finish) facing outwards. This keeps the corners of the mat flat when practicing. To Break In: The surface texture of the Black Mat PRO improves with use. Our customers have found that the best way to break in their mat is to use it on a daily basis over 3 months. Another trick is to sprinkle coarse sea salt over your mat, use just a spritz of water or dampen with a cloth, scrub it down with a stiff scrub brush, and air dry in the sunshine. To Clean: We recommend using Manduka Mat Renew or any non-solvent household cleaner and a damp cloth or sponge. Hang to dry in the sunshine. DO NOT clean your mat with the garden hose, put in the bathtub or shower, or put it in the washing machine- it may break the machine and ruin your mat! Manduka PRO series yoga mats, designed to last a lifetime (or two), curb the amount of PVC mats that enter landfills every year and reduces overall mat consumption. Also, during the manufacturing of most PVC products, toxic emissions may be released into the air. However, PRO series mats are manufactured through a process that ensures no toxic emissions are released into the atmosphere. The Black Mat¨ PRO is certified safe for human contact by OEKO-TEX, an environmental certification agency in Europe for the textile industry. 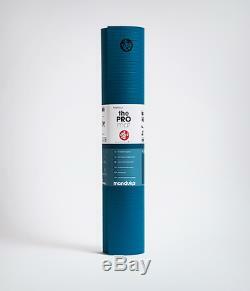 The item "MANDUKA BLACK PRO HARBOUR BLUE 6MM 71 X 26 PRO Yoga Mat New LIFE TIME WARRANTY" is in sale since Wednesday, June 13, 2018. This item is in the category "Sporting Goods\Fitness, Running & Yoga\Yoga & Pilates\Mats & Non-Slip Towels".